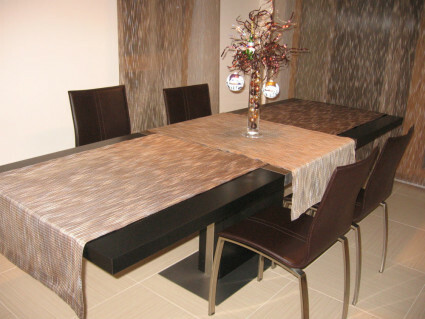 A tablecloth is an elegant addition to the interior design, a sign of good taste and knowledge. Tablecloth design possibilities are limitless – from different natural materials to synthetic fabrics and various combinations. These are the tablecloths that are suitable to various public places – restaurants, cafes, hotels, etc. In the sewing of professional tablecloths, we use special fabric (with or without teflon coating) intended for sewing tablecloths and napkins. These tablecloths are intended for frequent heat treatment, they are non-creasing, easy-to-iron and retain their shape, size and visual appearance even after repeated washing. Tablecloths for decorating the table, buffet or the like. These may be sewn from a wide range of fabrics, using and combining decorative elements and material combinations. Order a tablecloth for your celebration, which will bring elegance, luxury and harmony in your home. Natural, elegant, a little noble and unusual material which has not lost its relevance over the years. Linen tablecloths should not be machine-dried, but they may be slightly dampened with water with some added laundry softener to make them softer. It must be taken into account that any linen product – tablecloth, curtain, napkins, covers etc. – will shrink a little when washed. A fashion trend that currently dominates the interior design. The contrasting of rough textile textures with subtle, ethereal fabric, for example, linen with taffeta or velvet with organza. The tablecloth may have a heavy edges or, on the contrary, the central part of the tablecloth may be emphasised. Such fabric combinations may be supplemented with pearl embroidery, ornamental lace, ribbons, flitters, fabric flowers, fur bands etc. Crocheted ornamental tablecloth edges will look great, as hand work adds uniqueness and originality to any look. Will we put our ingenuity into our work and will not shy away from experiments, for example, we may add marine stones hanging on threads of different length to the side seam of a transparent and slippery organza tablecloth as weights. The fringe along the edge of the tablecloth may be in various lengths, even covering the floor. Wrinkled effect is just as topical in clothing and in tablecloths, curtains, pillows and other home textiles. The tablecloth as a complementary element to your interior will help to creat a harmonious interplay with other textiles in the room. Tablecloth prices depend on the size, the selected fabric or fabric combinations and any additional decorative elements.